I’ve been nominated! Thank you SOOOOOO much http://glasmetwater.wordpress.com/ !! 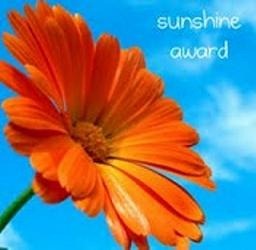 Sunshine Award is a great viral concept to get acquainted with new blogs. oliviapalermo.com/ – Last but not least! This entry was posted in Fashion and tagged blog, sunshine award, viral campaign by sofischoice. Bookmark the permalink.